A report released on Wednesday has ranked Nigeria's oil and gas and mining sectors as among the most opaque in the world. The report, which was conducted by an independent non-profit organisation, the Natural Resources Governance Institute (NRGI), ranked Nigeria 55 out of 89 countries whose viability of their extractive industries policies and practices are assessed. The NRGI points people to the benefits of their countries' oil, gas and mineral wealth through research, capacity development, technical advice and advocacy. The 2017 Resource Governance Index (RGI), which assesses how 89 resource-rich countries govern their oil, gas and mineral wealth, particularly scored the Nigeria low in the area of licensing pointing out that the Nigerian government rarely discloses "government officials' financial interest in the extractive sector or identities of beneficial owners of extractive companies." The report which scored Nigeria 17 out of 100, placing it 77 out of the 89 countries reviewed in the assessment of licensing, pointed out that though the government has made commitment with the Extractive Industries Transparency Initiative (EITI) and the Open Government Partnership (OGP), it is yet to disclose details of contracts in oil, gas and mining contracts in its "Seven Big Wins" strategy. Last October, President Muhammadu Buhari unveiled the new policy direction tagged Seven Big Wins, meant to revamp and revive the oil and gas sector. The key areas of the policy include: Niger Delta and security, policy and regulation, business environment and investment drive, transparency and efficiency, stakeholder management and international coordination, gas revolution, and refineries and local production capacity. The RGI noted that though there have been improved transparency in the area of collection of revenue in the last five years, tracking payment made by oil and gas companies have been challenging. "According to Nigeria's 2014 EITI data, just over half of public revenues from oil and gas were distributed to the federal government and the rest were shared between the state and local governments. The public lacks access to audited information on revenue flows to lower levels of government, and this contributes to the gap between the quality of the legal framework and actual implementation," the report stated. The report gave the Nigerian National Petroleum Corporation (NNPC) a poor governance rating score of 44 out of 100. It stated that the NNPC still posed serious accountability and transparency challenge. "Little information is publicly available, particularly concerning some of NNPC's least efficient and most questionable activities, notably earnings by its subsidiaries, the costs of its operations and its significant spending on non-commercial activities. "Government agencies and external auditors have disputed NNPC's interpretation of rules set in the constitution and the NNPC Act governing monetary transfers between NNPC and the government. 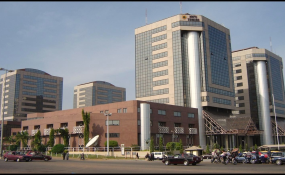 Officials exercise significant discretion around how NNPC sells the government's share of oil production--for example, when selecting buyers, pricing exports or transferring sales proceeds to the government," the report noted. The report also stated that Nigeria performed poorly in the management and governance of the Excess Crude Account (ECA), ranking last alongside Qatar of all the countries assessed. It observed that the Nigerian government does not disclose the rules and practices governing deposits and withdrawal or investments of the ECA. "As the largest fund by asset balance, the ECA constitutes a vast governance concern at the end of the oil sector value chain," it noted.